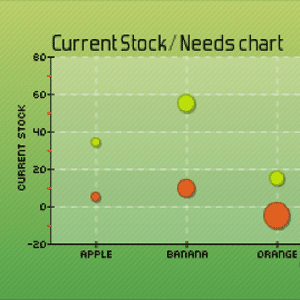 pChart is a remarkably advanced graphing toolkit for PHP. It’s free under GPL licence, highly customisable, fully object oriented, and more than capable of handling any data you throw at it. Let me show you how to get started with using it for your web app. This tutorial assumes a basic knowledge of PHP. Easy to get started with tons of example code. Best-fit line calculation – just give it the data points and let it do the work. Conditional formatting, to create really visually appealing graphs. Comprehensive caching class to speed up your graphing in a production environment. Download the latest pChart package and upload it to the root of your web server. Rename the direct to pChart. You can test it out right away by navigating to this directory which will load the example graphs. The next step is to create a dataset, and use the addPoints method. Notice that you can use a VOID keyword if data is missing. You could also connect to a MySQL data source and pull an array of data from there, or load a CSV file from somewhere. We’re going to be drawing a very simplistic graph ofcourse, but you can also add multiple datasets, adjust ticks etc at this point. Next you need to create the image object, set the graphing area, and choose a font. SparkLine PHP is an implementation of the distinctive tiny graphs so named by Edward Tuffte. JqPlot is a jQuery based graphing solution, which would shift the graphing computation to the users browser rather than your server, ideal if you’re trying to plot mathematical functions. PHPMyGraph isn’t as comprehensive, customisable, or attractive as pChart, but it’s also a lot simpler. EasyChart Builder is a simple WordPress plugin, but this requires your dataset to be added manually. Google Image Chart creator has a wide selection of graphs and can be easily embedded, but also requires you to manually enter your dataset. That’s it from me this time, I do hope you have a play with pChart in web apps you’re making. I’ve just started working it into the web side of my Egg Counter iPhone application, so I’m certainly no expert on it yet. I’ll try to point you in the right direction if you have any questions, but there’s also extensive documentation available. Do you have a better way of graphing data in your web apps? Let us know! You are Hero ..Really a big thanks. How about phpChart? It generates web-based charts using PHP.